Mitt Romney gave a generally fine speech today on the Middle East. Sensibly, he criticized the Obama administration for its Benghazi shenanigans, for the "daylight" with Israel, fecklessness vis-à-vis Tehran, and the cuts in military spending. Very justifiably, he called it "time to change course in the Middle East." 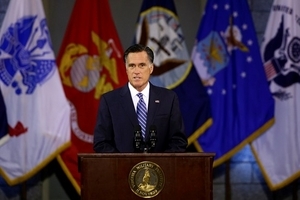 First, Romney's policy ideas echo the rosy-tinted themes of George W. Bush's failed policies in the region. Flush with optimism for Afghanistan, Iraq, and "Palestine," Bush spoke a language that now seems from another world. For example, almost exactly nine years ago he predicted "a free Iraq [that] will be an example of freedom's power throughout the Middle East." I espy shades of this otherworldliness in Romney's pronouncement that the Middle East hosts "a struggle between liberty and tyranny, justice and oppression, hope and despair," his goal to build democratic institutions in Egypt, and his dream of "a democratic, prosperous Palestinian state living side by side in peace and security" with Israel. These are slogans, not serious policy. Second, except in reference to the attack in Benghazi, Romney pointedly avoids mention of Islam, Islamism, or jihad. Rather, he refers to "terrorists who use violence to impose their dark ideology," avoiding the real issue and portending problems ahead. Third, his readiness to jump into the Syrian morass worries me. While one can hardly disagree with Romney's call to "identify and organize those members of the opposition who share our values and ensure they obtain the arms they need," those friendly members of the opposition are, in fact, a bedraggled few. Operationally, Romney is prepared to arm the Turkish-allied Islamists, a long-term prospect even more frightening than the Iranian-allied Assad regime now in power. Oct. 8, 2012 update: Diana West makes some of these same points and many others in a witty analysis, "Dear Mitt, Imagine Uncle Sam Were a Bain Client."